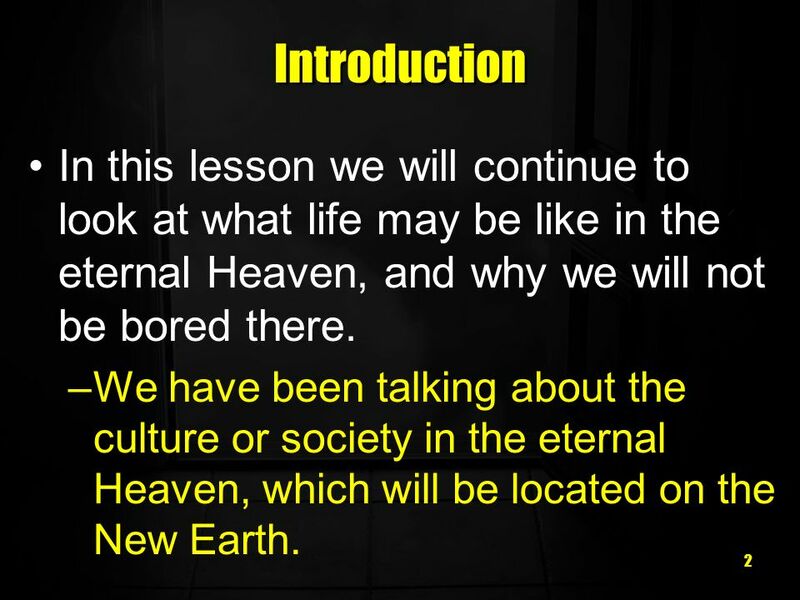 2 In this lesson we will continue to look at what life may be like in the eternal Heaven, and why we will not be bored there. –We have been talking about. 3 3 Will We Shape Culture? 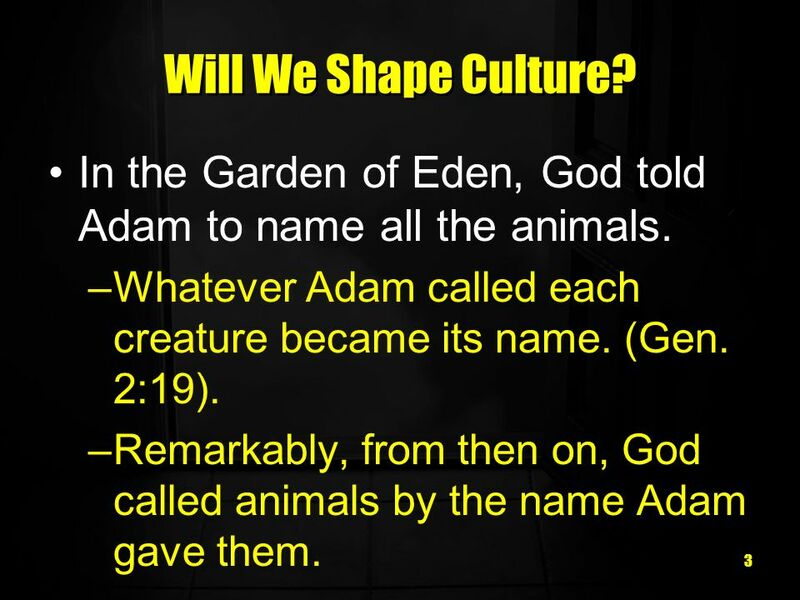 In the Garden of Eden, God told Adam to name all the animals. –Whatever Adam called each creature became its name. (Gen. 2:19). –Remarkably, from then on, God called animals by the name Adam gave them. 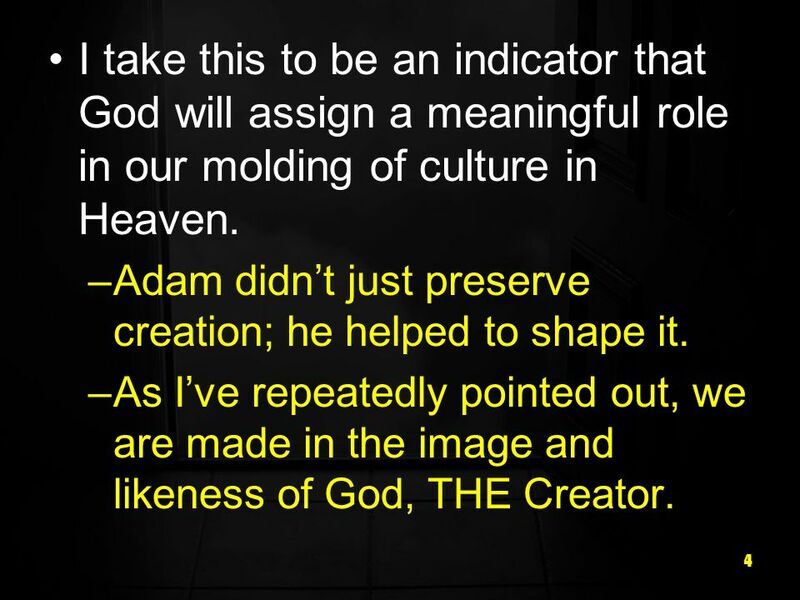 4 4 I take this to be an indicator that God will assign a meaningful role in our molding of culture in Heaven. –Adam didnt just preserve creation; he helped to shape it. –As Ive repeatedly pointed out, we are made in the image and likeness of God, THE Creator. 5 5 It is in our makeup to be creative. –Imagination is not just a feature of the arts; it is a feature of human life itself. 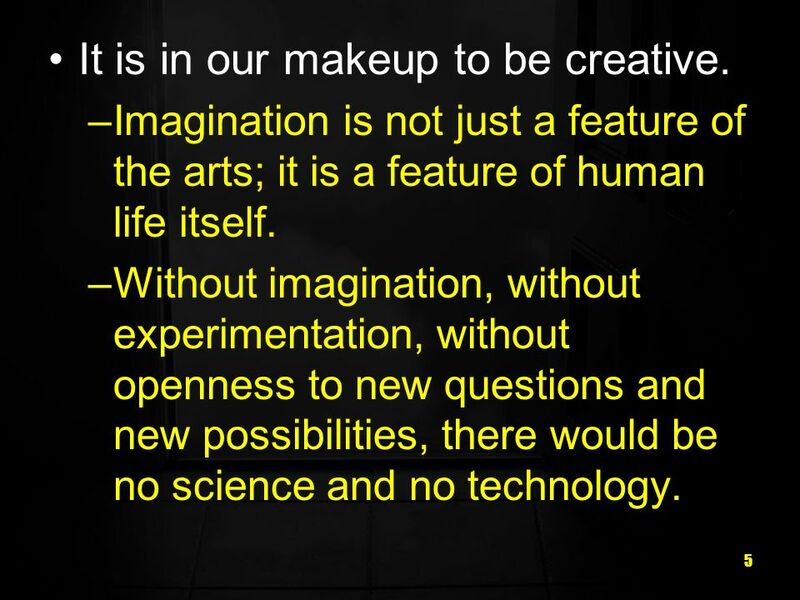 –Without imagination, without experimentation, without openness to new questions and new possibilities, there would be no science and no technology. 6 6 When the mind is used creatively in humility and faith, we are taking up our responsibility before God to govern and shape what He has placed in our control. 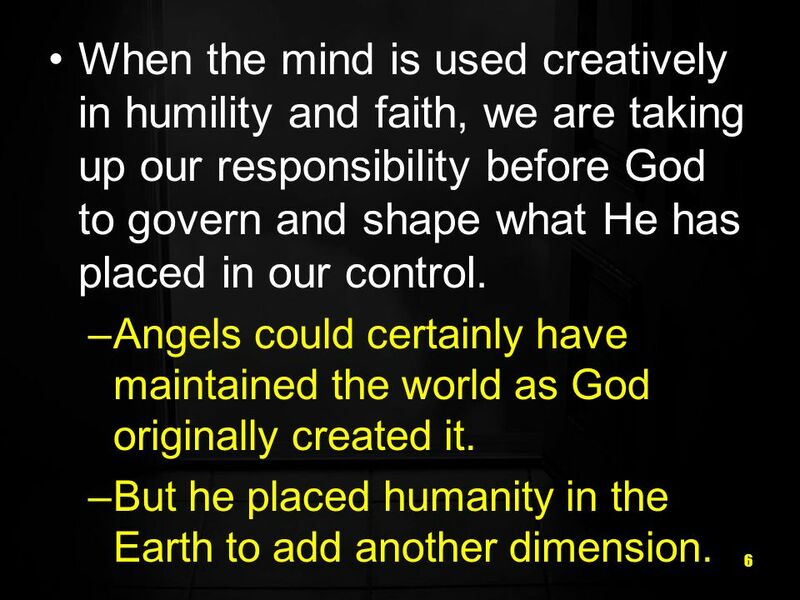 –Angels could certainly have maintained the world as God originally created it. –But he placed humanity in the Earth to add another dimension. 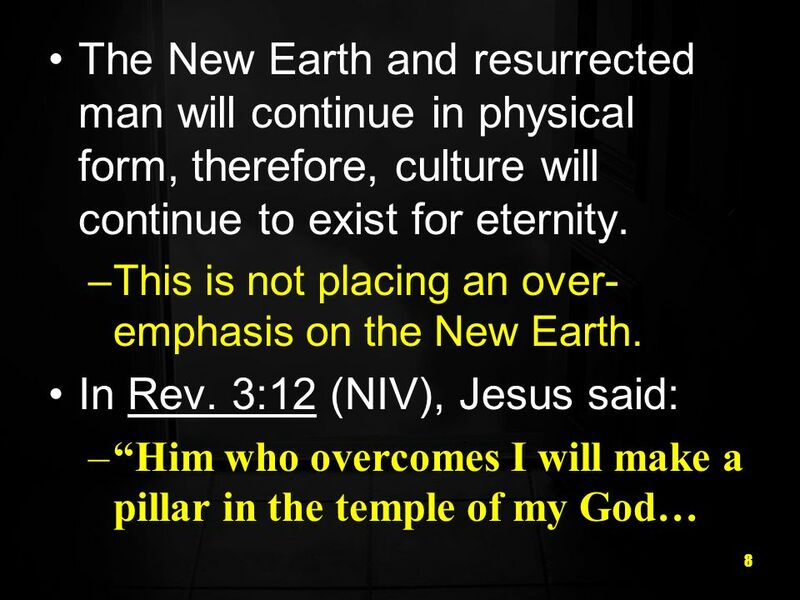 7 7 As Gods image-bearers, mankind was introduced to develop, expand and enrich the Earth. –And essentially, that is what culture does. Culture includes art, science, and technology. 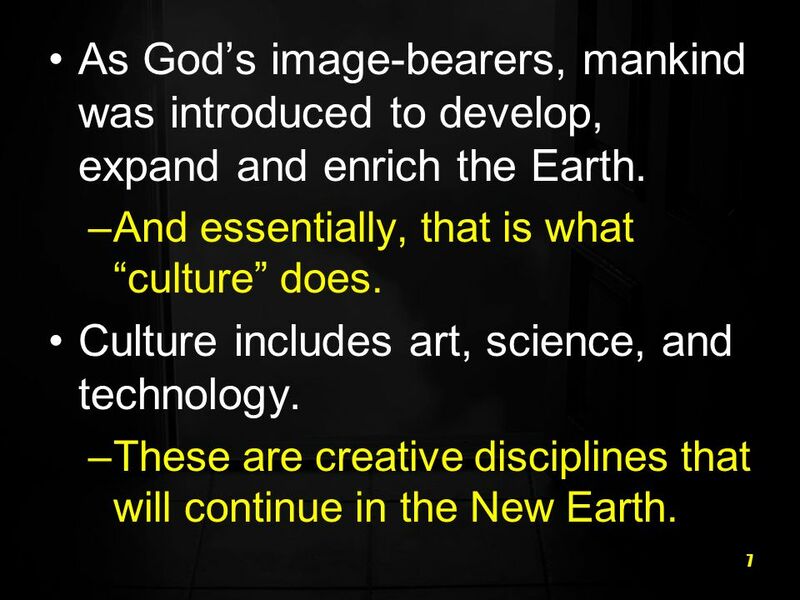 –These are creative disciplines that will continue in the New Earth. 9 9 –…Never again will he leave it. I will write on him the name of my God and the name of the city of my God, the new Jerusalem, which is coming down out of heaven from my God; and I will also write on him my new name. 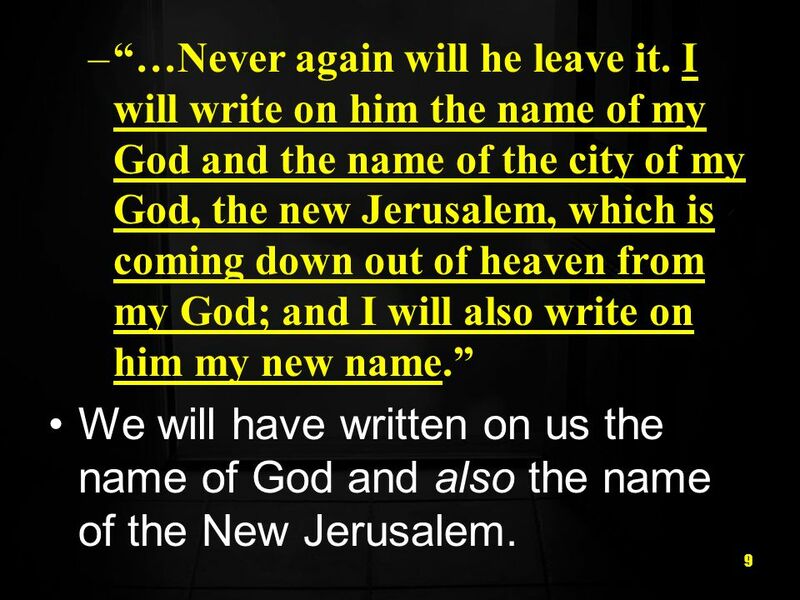 We will have written on us the name of God and also the name of the New Jerusalem. 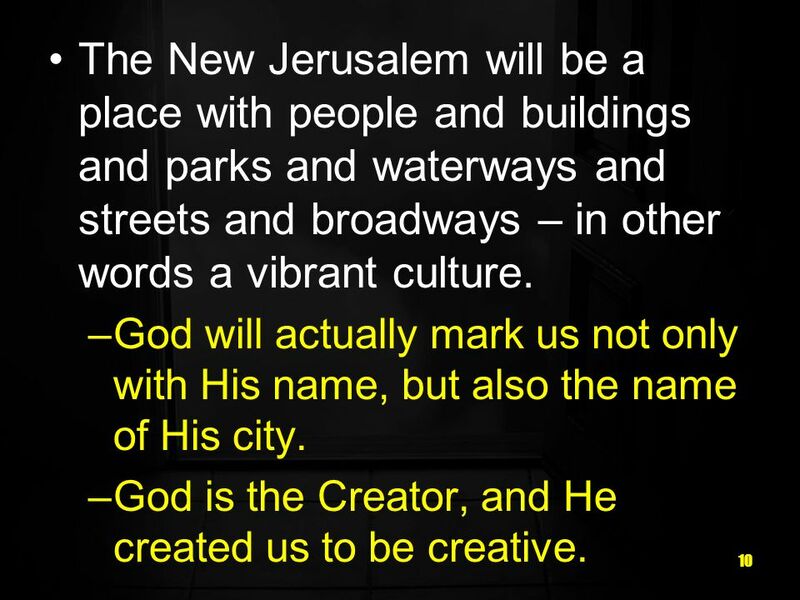 10 10 The New Jerusalem will be a place with people and buildings and parks and waterways and streets and broadways – in other words a vibrant culture. –God will actually mark us not only with His name, but also the name of His city. –God is the Creator, and He created us to be creative. 11 11 What we produce is merely an extension of Gods creation. 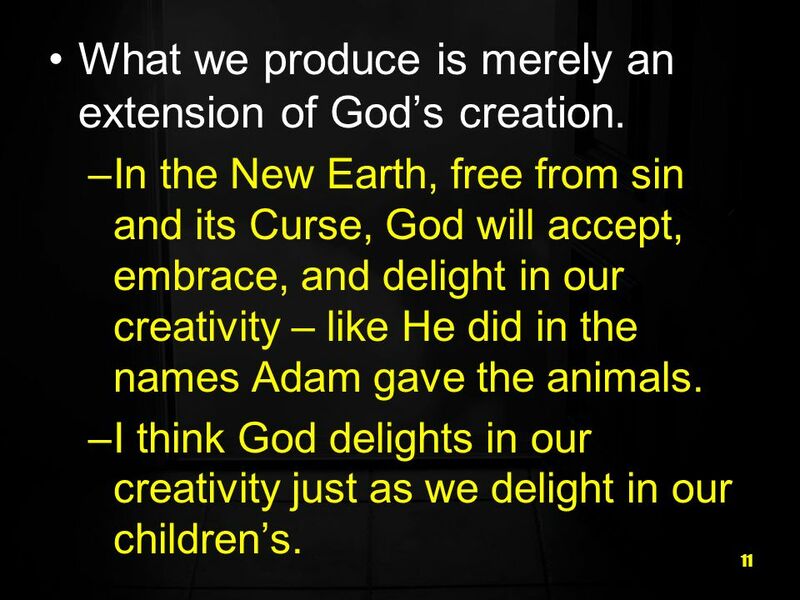 –In the New Earth, free from sin and its Curse, God will accept, embrace, and delight in our creativity – like He did in the names Adam gave the animals. –I think God delights in our creativity just as we delight in our childrens. 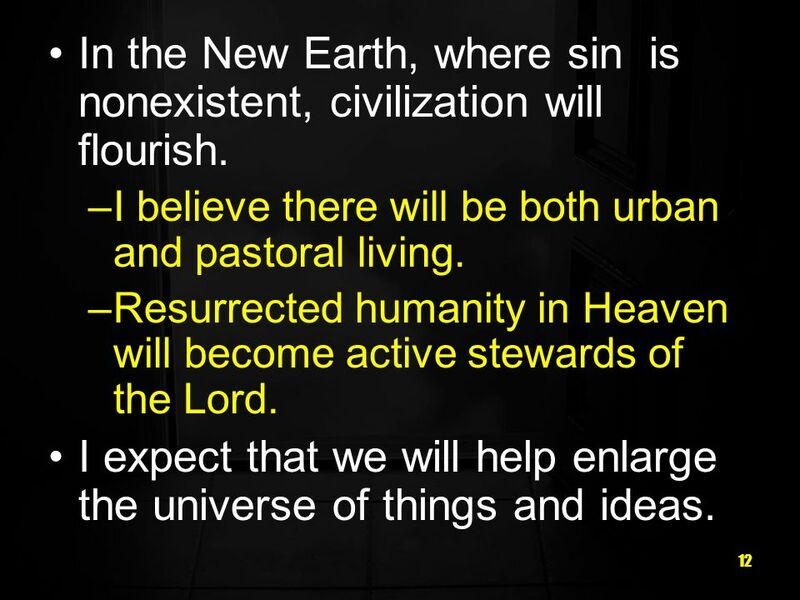 12 12 In the New Earth, where sin is nonexistent, civilization will flourish. –I believe there will be both urban and pastoral living. –Resurrected humanity in Heaven will become active stewards of the Lord. I expect that we will help enlarge the universe of things and ideas. 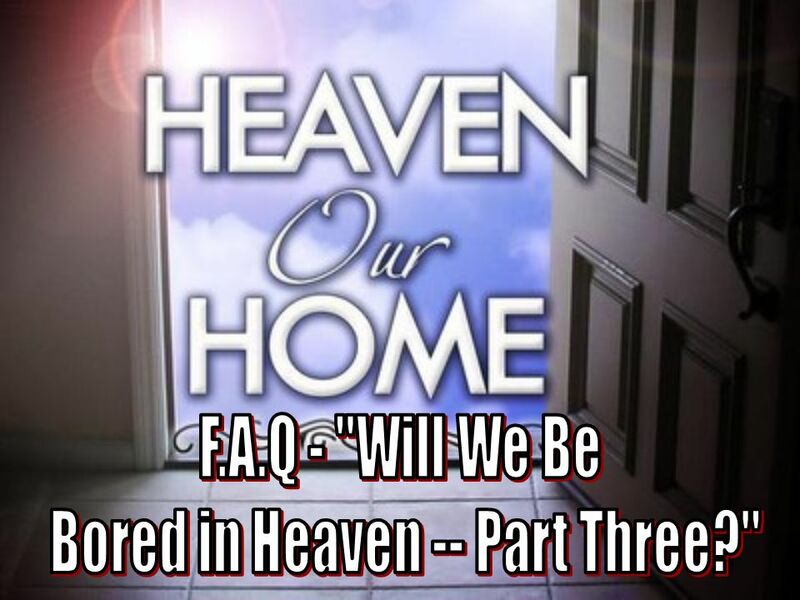 13 13 Will There Be Arts & Entertainment in Heaven? 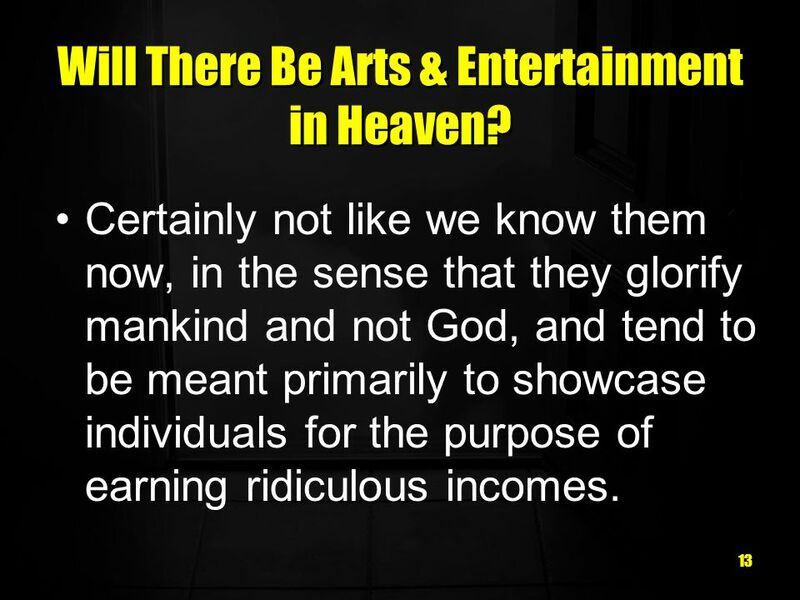 Certainly not like we know them now, in the sense that they glorify mankind and not God, and tend to be meant primarily to showcase individuals for the purpose of earning ridiculous incomes. 14 14 But, music, art, entertainment, books, etc., have played major roles in human culture. –I believe, in a much more God- oriented way, they will continue to be present in Heaven. 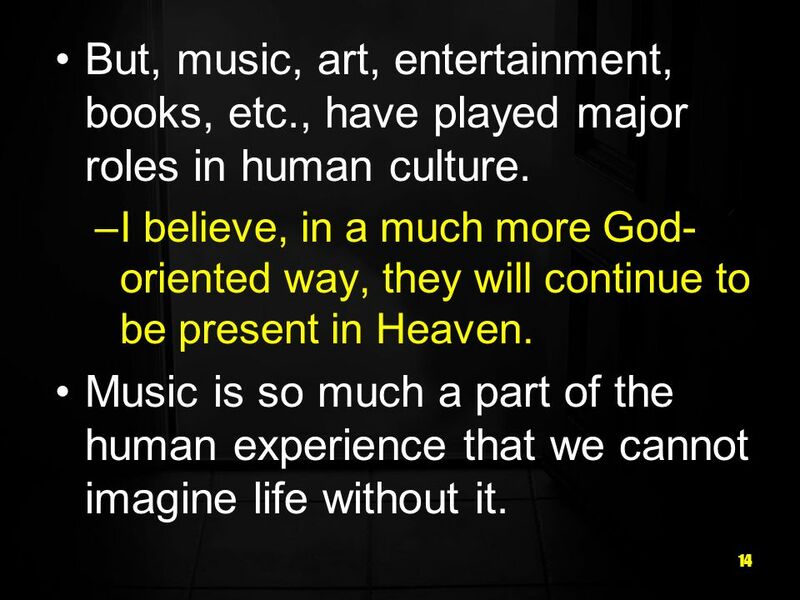 Music is so much a part of the human experience that we cannot imagine life without it. 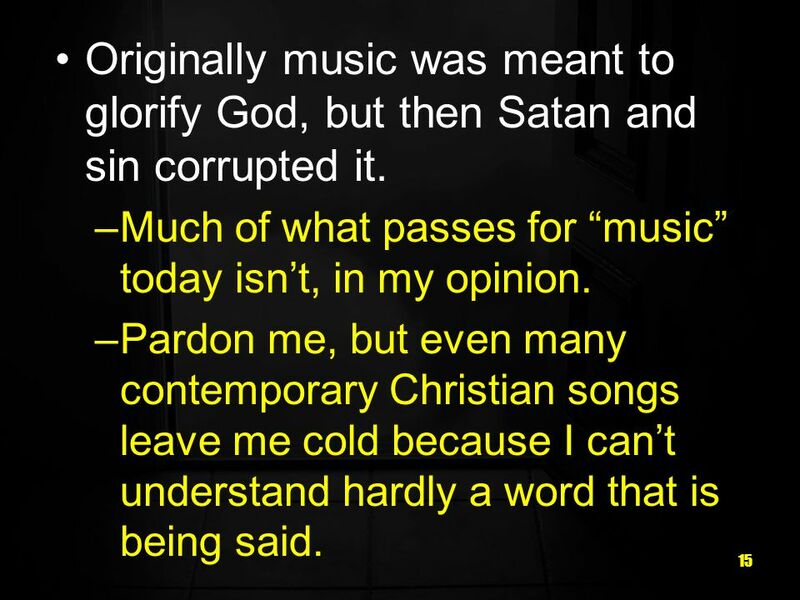 15 15 Originally music was meant to glorify God, but then Satan and sin corrupted it. –Much of what passes for music today isnt, in my opinion. –Pardon me, but even many contemporary Christian songs leave me cold because I cant understand hardly a word that is being said. 16 16 Even Christian music seems to have gotten off track, and it seems to be more about the beat, the tempo, the loud guitars, etc. 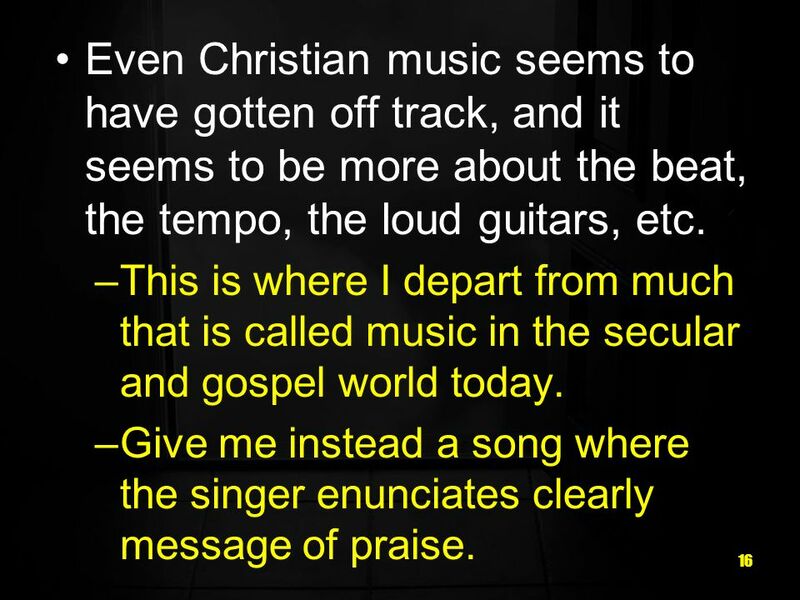 –This is where I depart from much that is called music in the secular and gospel world today. –Give me instead a song where the singer enunciates clearly message of praise. 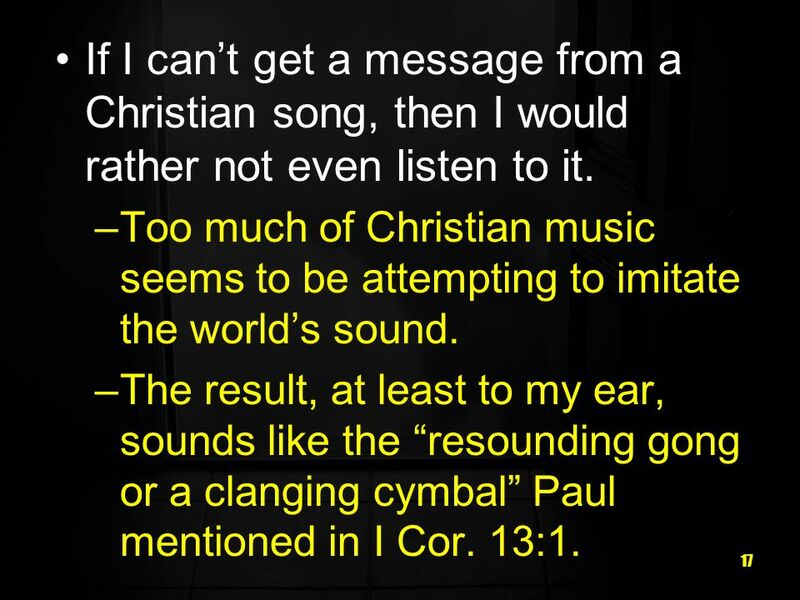 17 17 If I cant get a message from a Christian song, then I would rather not even listen to it. –Too much of Christian music seems to be attempting to imitate the worlds sound. –The result, at least to my ear, sounds like the resounding gong or a clanging cymbal Paul mentioned in I Cor. 13:1. 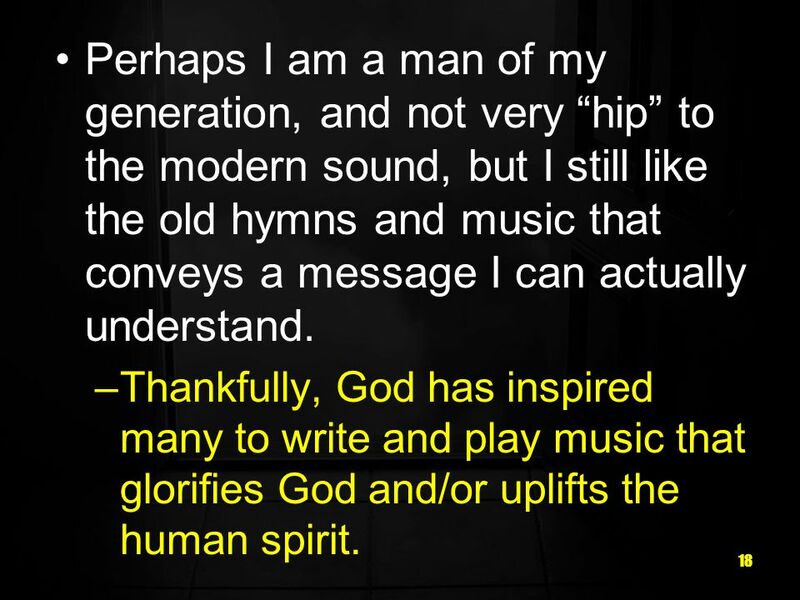 18 18 Perhaps I am a man of my generation, and not very hip to the modern sound, but I still like the old hymns and music that conveys a message I can actually understand. –Thankfully, God has inspired many to write and play music that glorifies God and/or uplifts the human spirit. 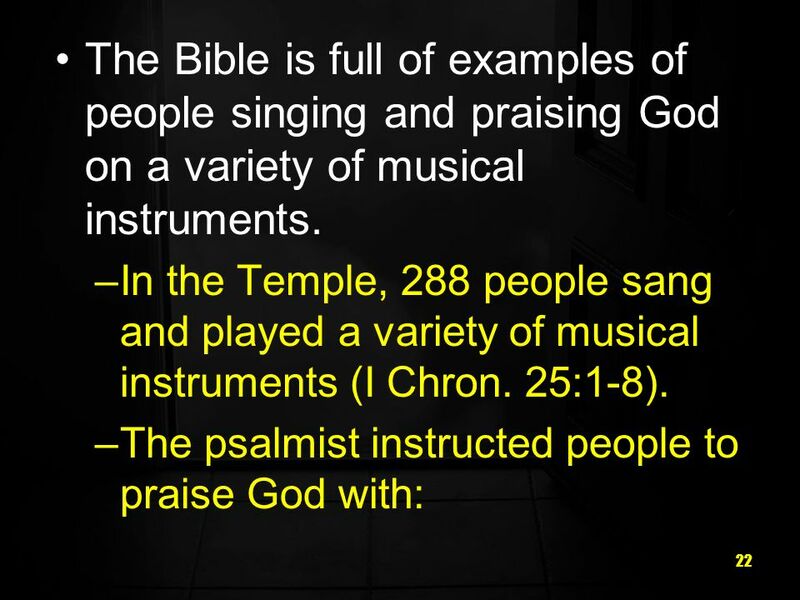 19 19 The Psalms were originally Hebrew songs. 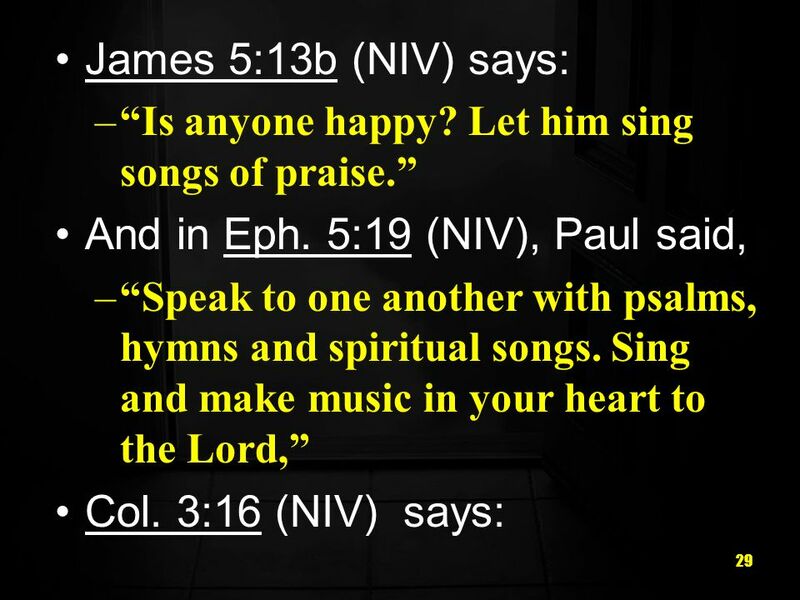 –When we listen to good music, or sing hymns, or enjoy some uplifting lyrics and music, these things should inspire true worship in us. 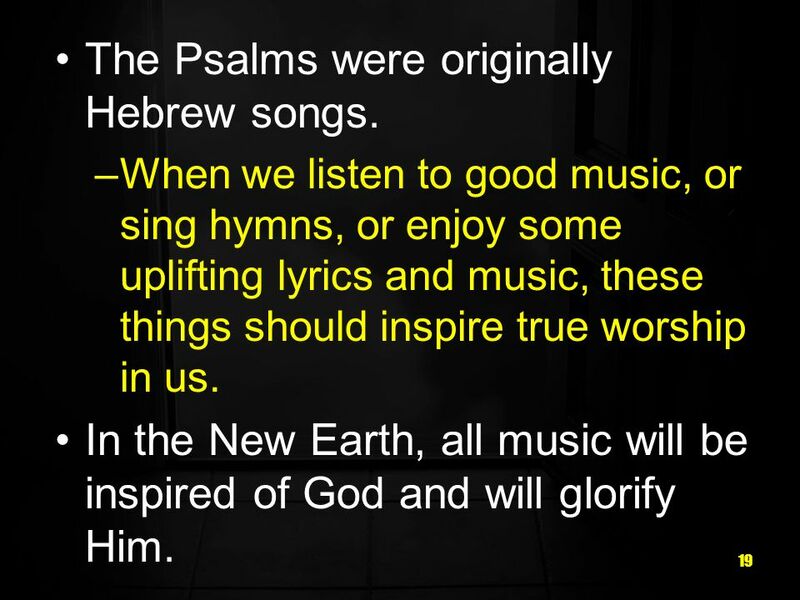 In the New Earth, all music will be inspired of God and will glorify Him. 20 20 Psa. 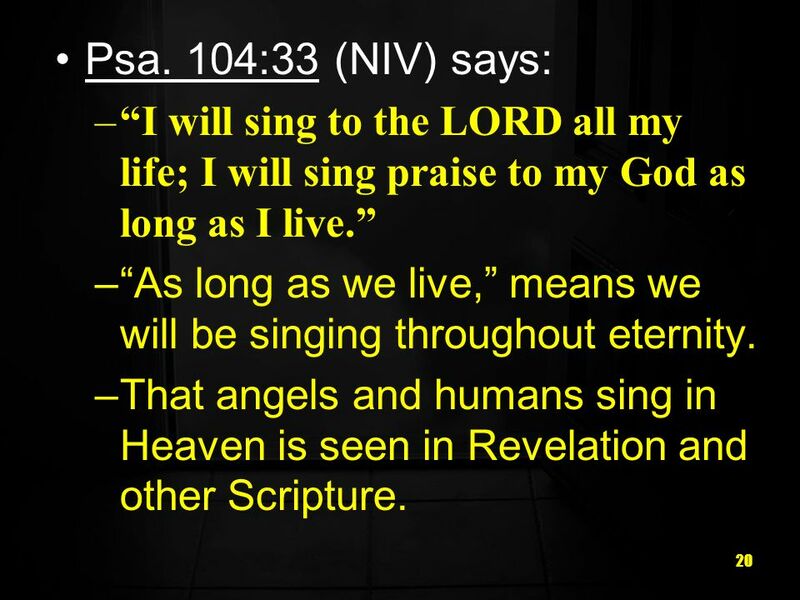 104:33 (NIV) says: –I will sing to the LORD all my life; I will sing praise to my God as long as I live. –As long as we live, means we will be singing throughout eternity. –That angels and humans sing in Heaven is seen in Revelation and other Scripture. 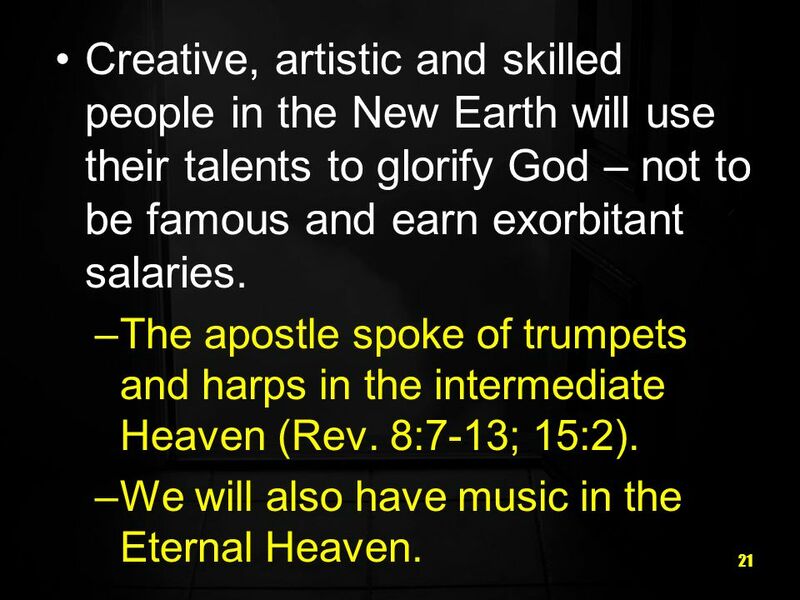 21 21 Creative, artistic and skilled people in the New Earth will use their talents to glorify God – not to be famous and earn exorbitant salaries. –The apostle spoke of trumpets and harps in the intermediate Heaven (Rev. 8:7-13; 15:2). –We will also have music in the Eternal Heaven. 23 23 Trumpets, lyres, harps, stringed instruments, tambourines, flutes and cymbals (Psa. 150). In Isa. 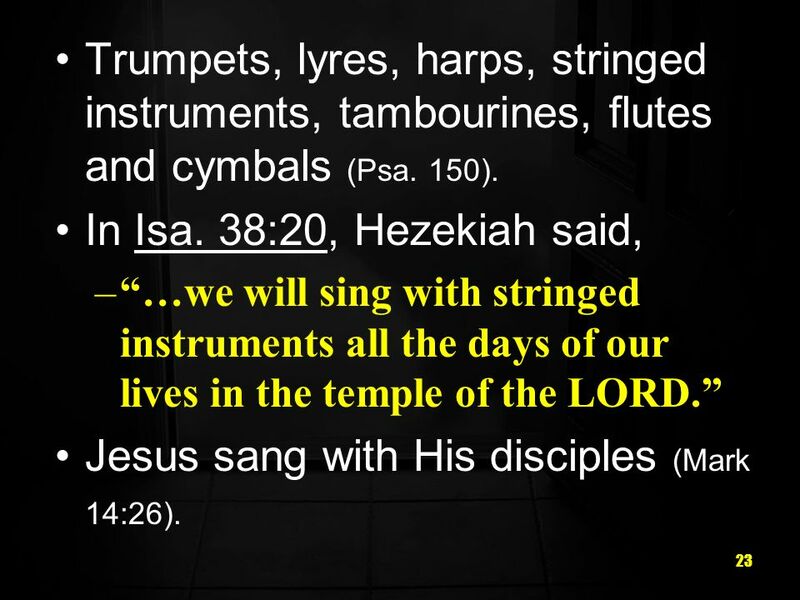 38:20, Hezekiah said, –…we will sing with stringed instruments all the days of our lives in the temple of the LORD. Jesus sang with His disciples (Mark 14:26). 24 24 –The sound I heard was like that of harpists playing their harps. 3 And they sang a new song before the throne and before the four living creatures and the elders. 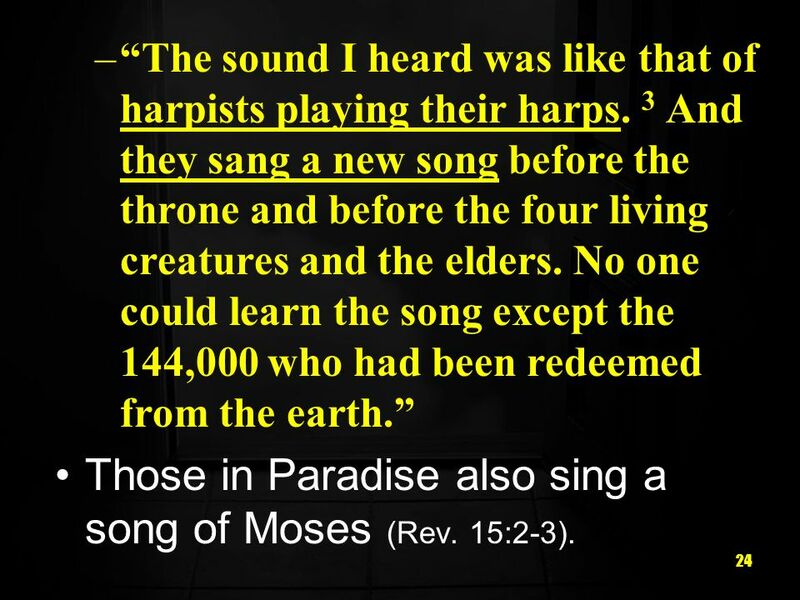 No one could learn the song except the 144,000 who had been redeemed from the earth. Those in Paradise also sing a song of Moses (Rev. 15:2-3). 25 25 –This song was written on the sin- cursed Earth (likely the song recorded in Exod. 15, which rejoices in the redemption of Passover). 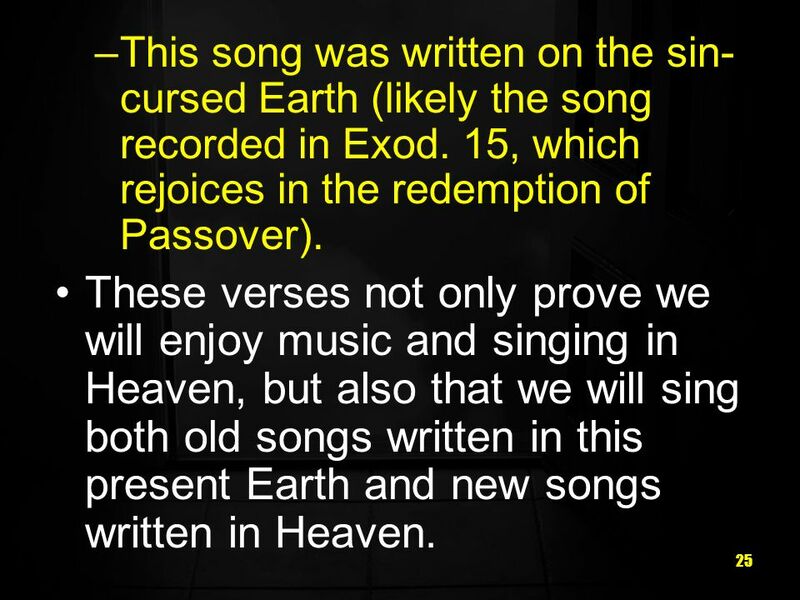 These verses not only prove we will enjoy music and singing in Heaven, but also that we will sing both old songs written in this present Earth and new songs written in Heaven. 26 26 Inspired, Scripturally sound songs will endure, but other music from Earth may also be preserved. 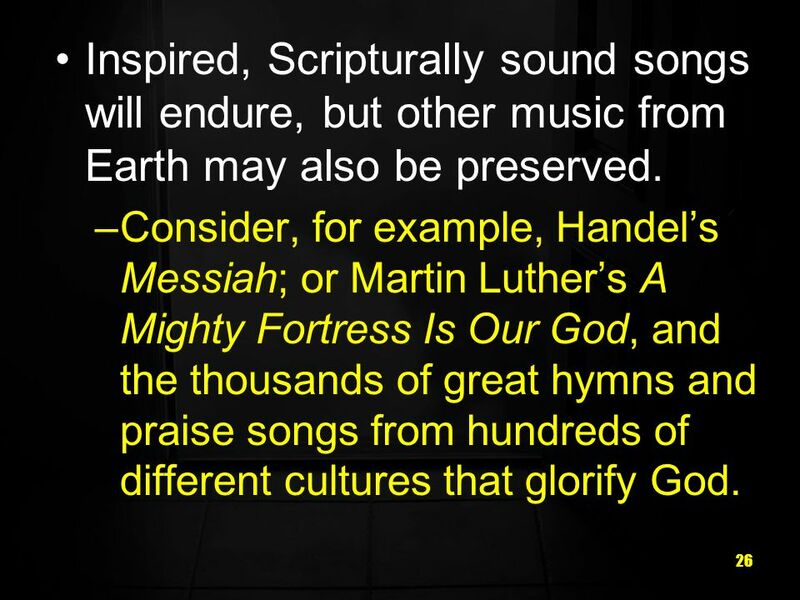 –Consider, for example, Handels Messiah; or Martin Luthers A Mighty Fortress Is Our God, and the thousands of great hymns and praise songs from hundreds of different cultures that glorify God. 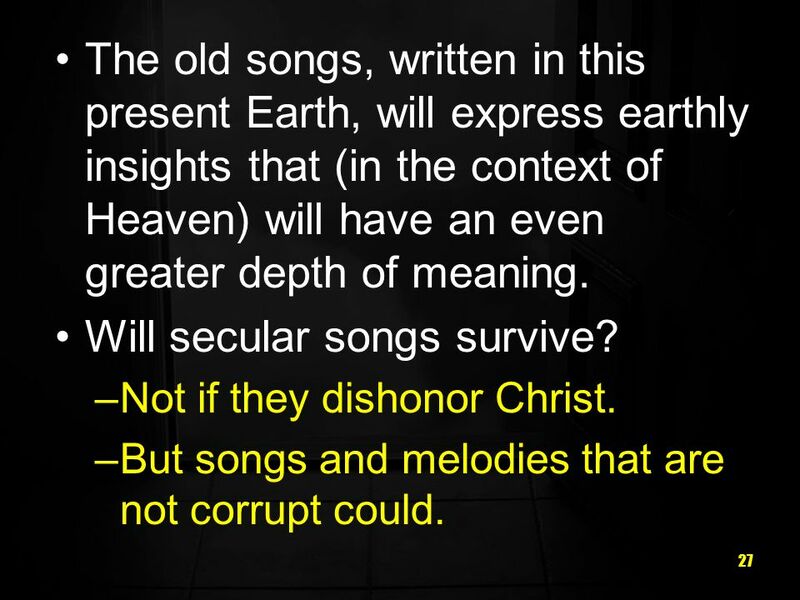 27 27 The old songs, written in this present Earth, will express earthly insights that (in the context of Heaven) will have an even greater depth of meaning. Will secular songs survive? –Not if they dishonor Christ. –But songs and melodies that are not corrupt could. 28 28 Music is transcendent – a bridge between this world and the next. –That may be why some devote so much time to it and gain pleasure from it. 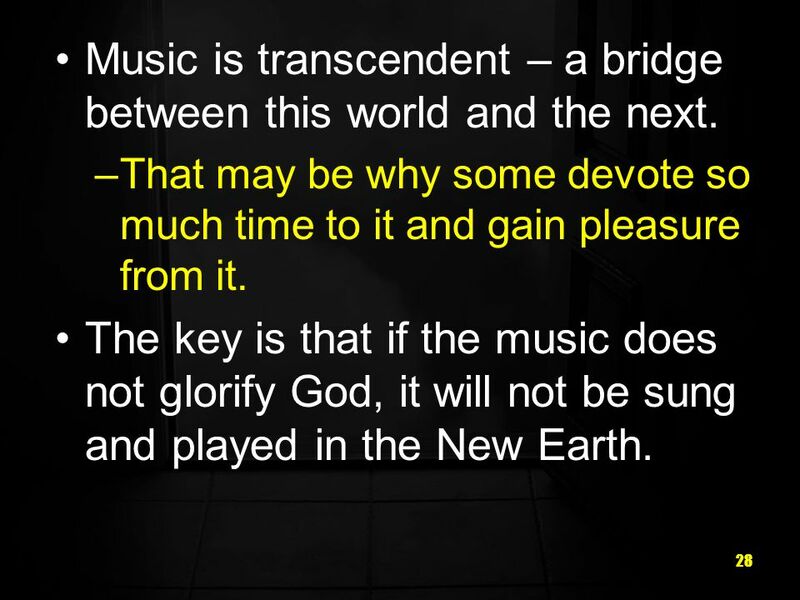 The key is that if the music does not glorify God, it will not be sung and played in the New Earth. 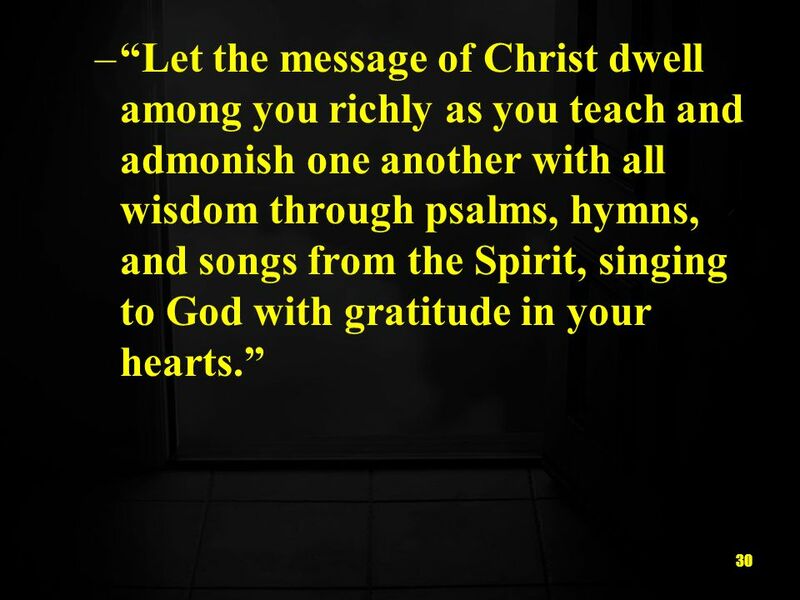 30 30 –Let the message of Christ dwell among you richly as you teach and admonish one another with all wisdom through psalms, hymns, and songs from the Spirit, singing to God with gratitude in your hearts. 31 31 Will We Dance In Heaven? 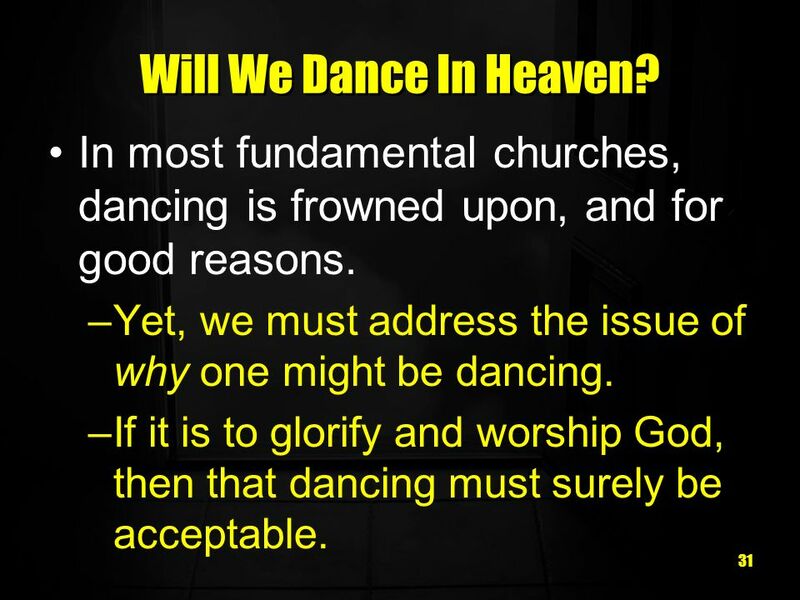 In most fundamental churches, dancing is frowned upon, and for good reasons. –Yet, we must address the issue of why one might be dancing. –If it is to glorify and worship God, then that dancing must surely be acceptable. 32 32 Let us not forget that throughout the Bible, people have danced to Gods glory on Earth (See: Eccl. 3:4; Jer. 31:12-14). 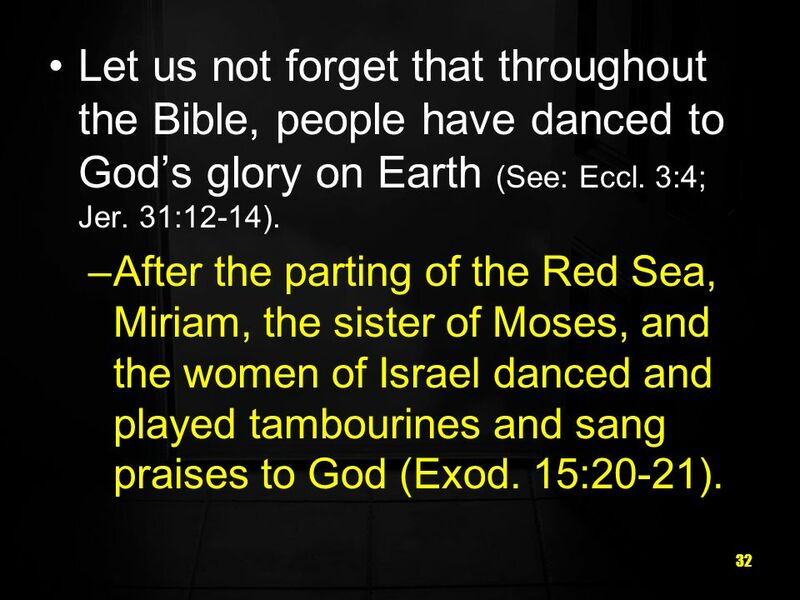 –After the parting of the Red Sea, Miriam, the sister of Moses, and the women of Israel danced and played tambourines and sang praises to God (Exod. 15:20-21). 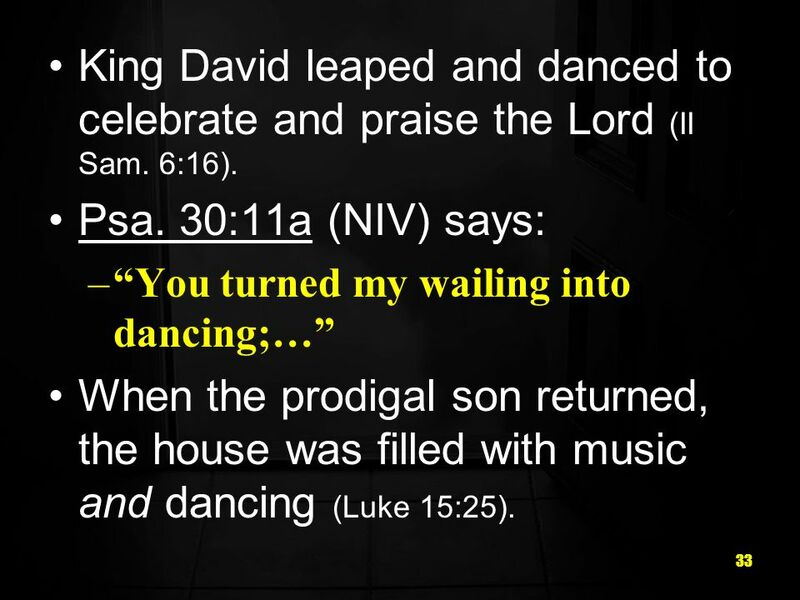 33 33 King David leaped and danced to celebrate and praise the Lord (II Sam. 6:16). Psa. 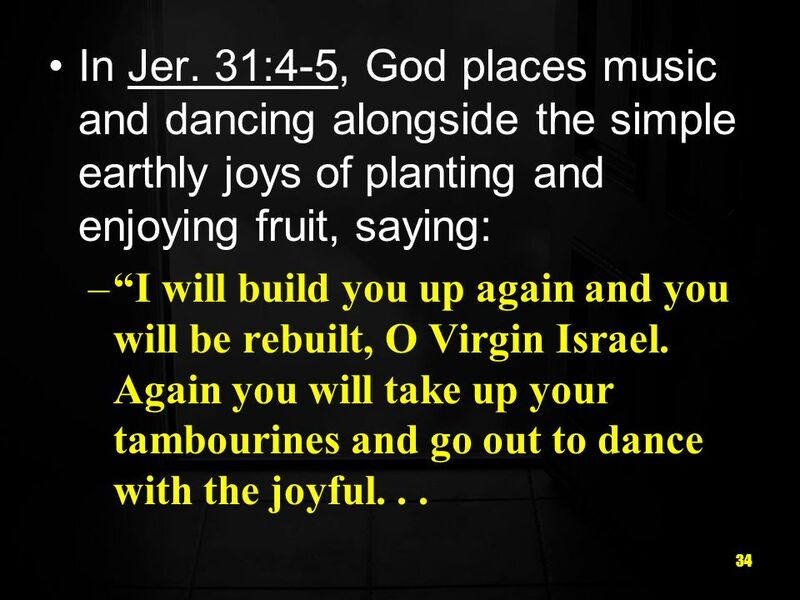 30:11a (NIV) says: –You turned my wailing into dancing;… When the prodigal son returned, the house was filled with music and dancing (Luke 15:25). 35 35 – 5 …Again you will plant vineyards on the hills of Samaria; the farmers will plant them and enjoy their fruit. It was God, not Satan who made this people dance. 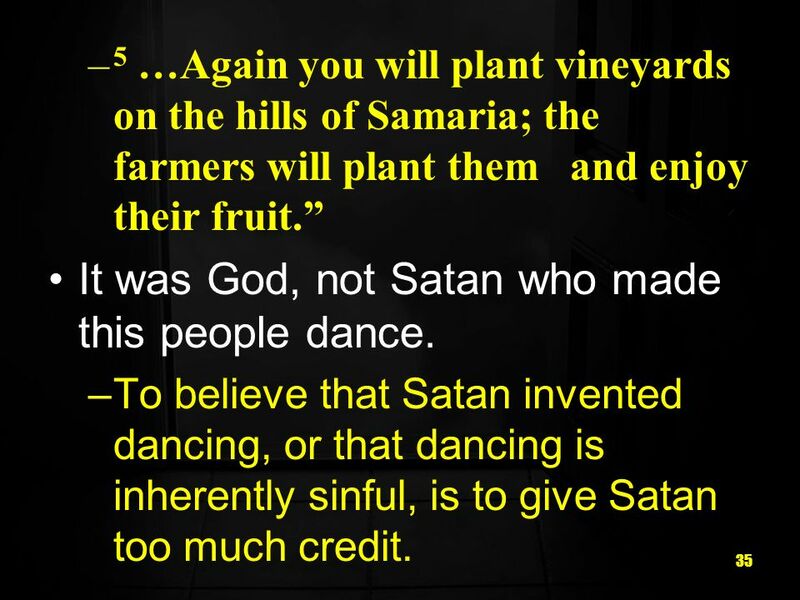 –To believe that Satan invented dancing, or that dancing is inherently sinful, is to give Satan too much credit. 37 37... Just as some eating and drinking, and even religious activities dishonor God. 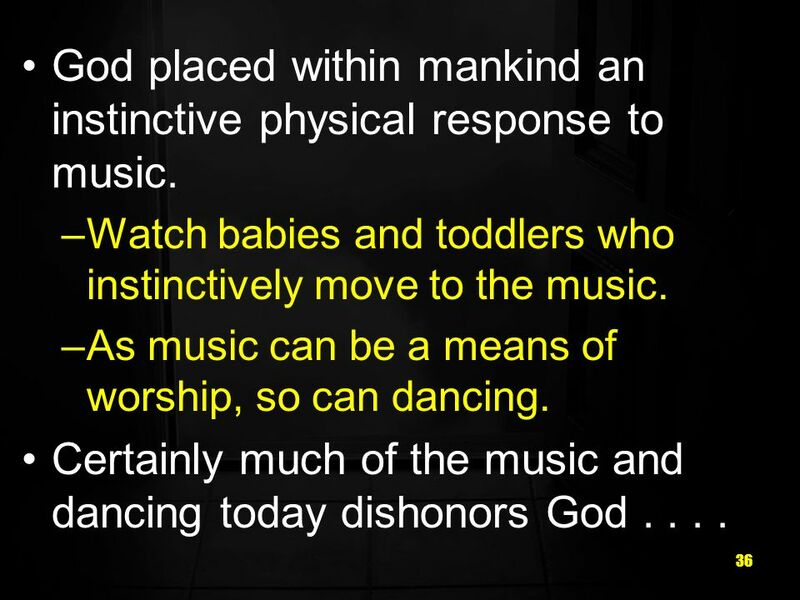 –Unfortunately, dancing and music have become associated with immorality. 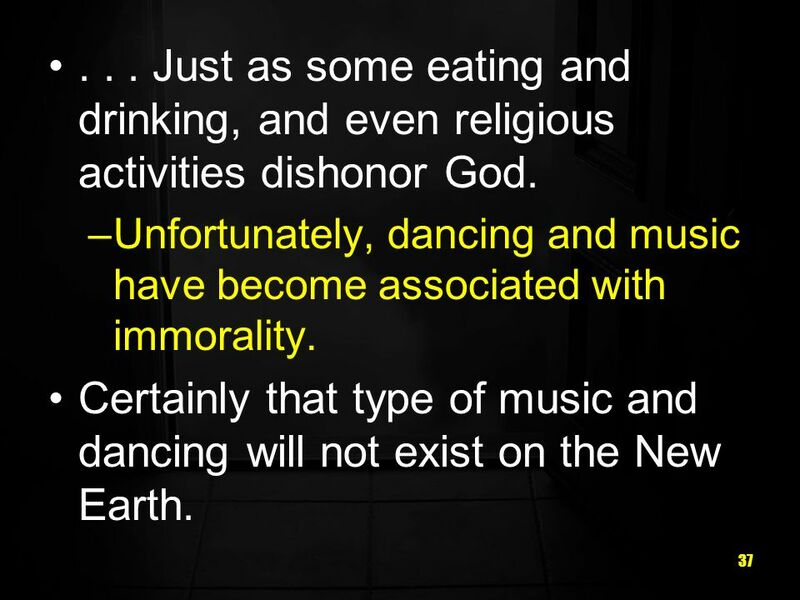 Certainly that type of music and dancing will not exist on the New Earth. 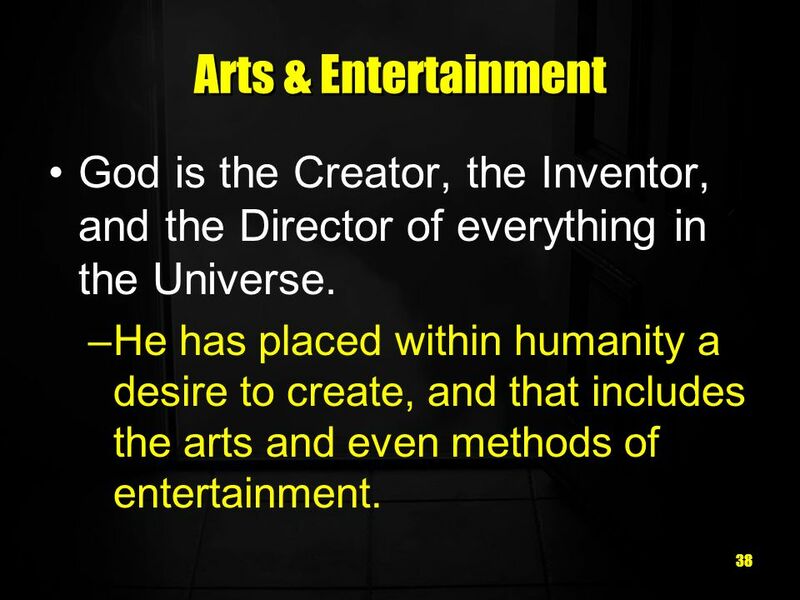 38 38 Arts & Entertainment God is the Creator, the Inventor, and the Director of everything in the Universe. –He has placed within humanity a desire to create, and that includes the arts and even methods of entertainment. 39 39 Again, some of the creations of artists and much of the entertainment in this present Earth is based in sin, and will not appear in heaven. 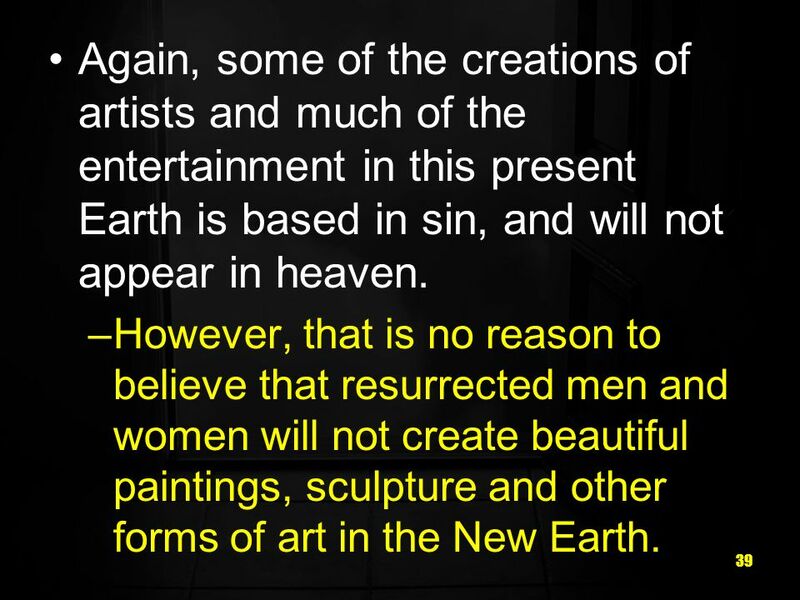 –However, that is no reason to believe that resurrected men and women will not create beautiful paintings, sculpture and other forms of art in the New Earth. 40 40 Art is a God-given talent, that will rise to new heights in the New Earth. 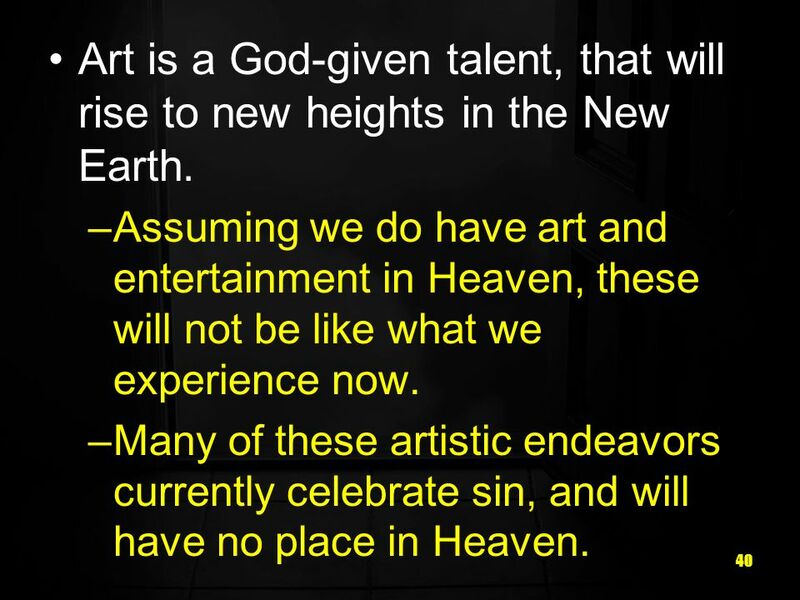 –Assuming we do have art and entertainment in Heaven, these will not be like what we experience now. 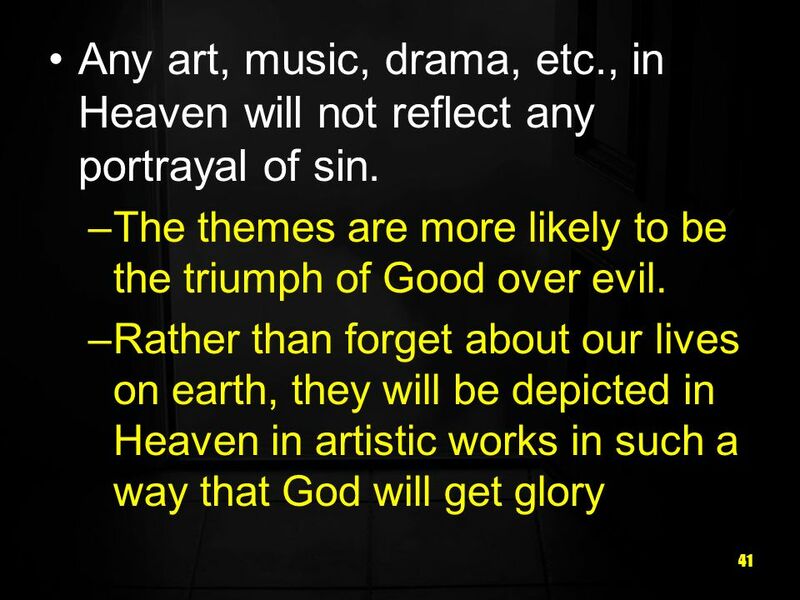 –Many of these artistic endeavors currently celebrate sin, and will have no place in Heaven. 42 42 For example, reading and writing (literature) arent the result of sin, they were the result of Gods creative design passed on to us. 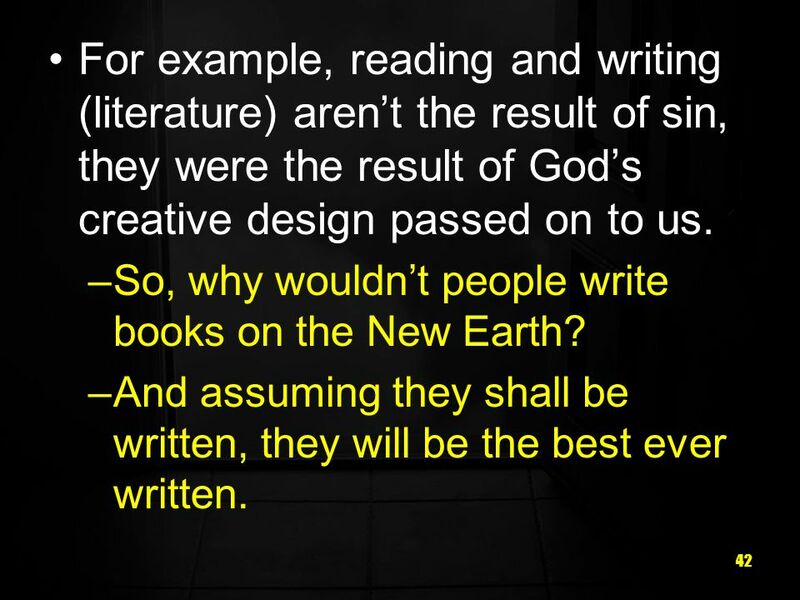 –So, why wouldnt people write books on the New Earth? –And assuming they shall be written, they will be the best ever written. 43 43 Authors will have new insights, new information, and a Godly mind and perspective. 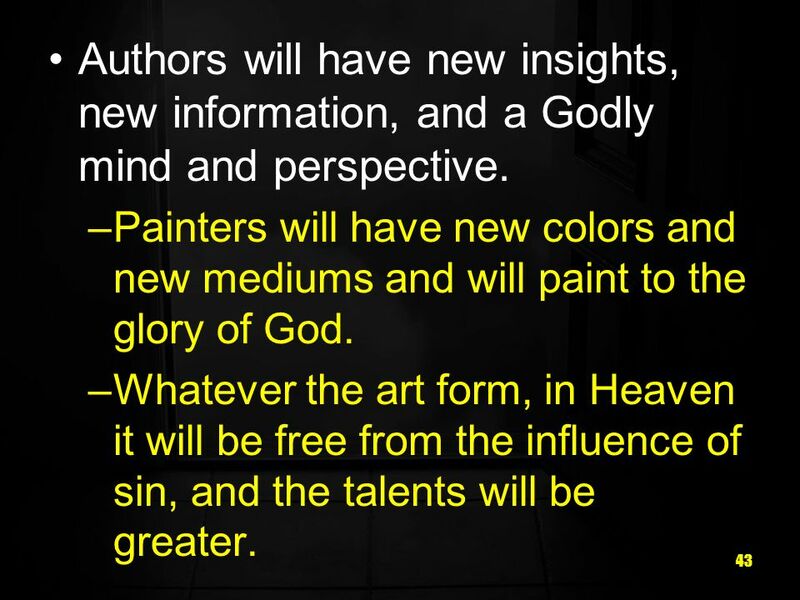 –Painters will have new colors and new mediums and will paint to the glory of God. –Whatever the art form, in Heaven it will be free from the influence of sin, and the talents will be greater. 44 44 We will be resurrected people with minds, hands and eyes. –A resurrected person will have the fullest range of creative abilities, and will be able to think in total alignment with the Word of God. 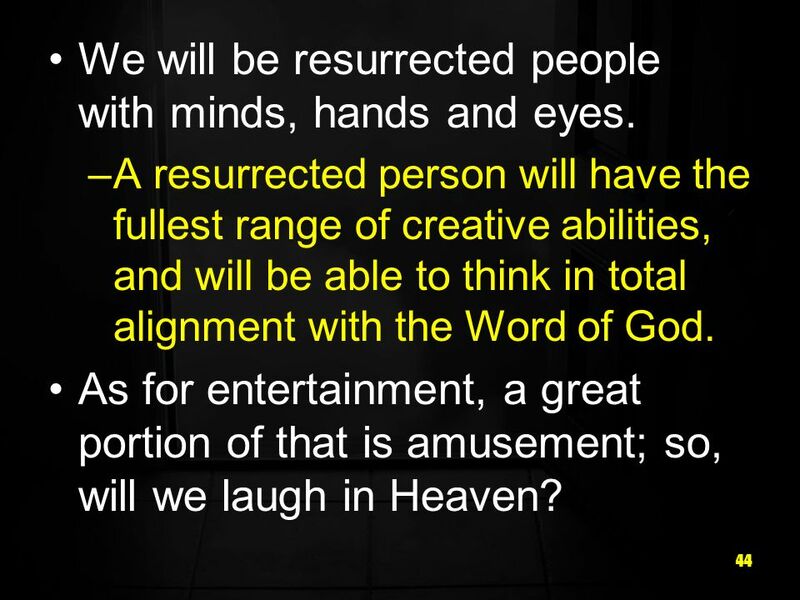 As for entertainment, a great portion of that is amusement; so, will we laugh in Heaven? 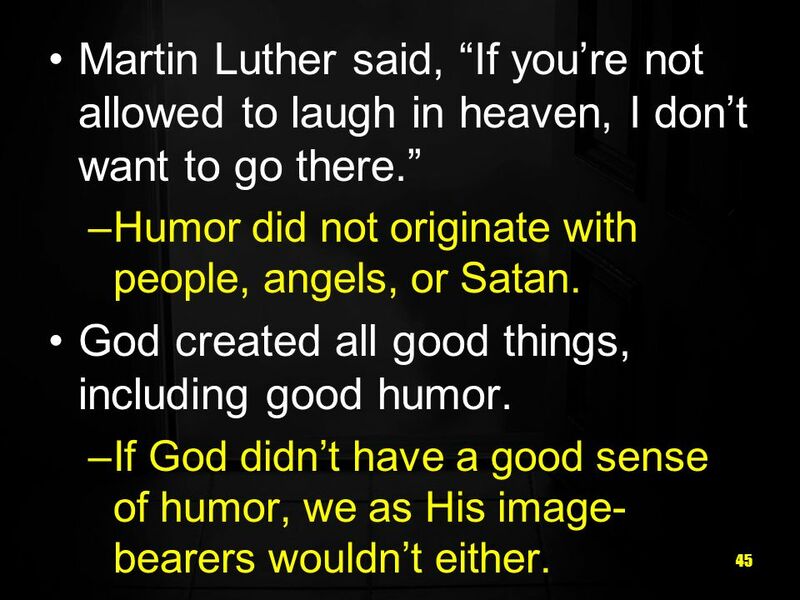 45 45 Martin Luther said, If youre not allowed to laugh in heaven, I dont want to go there. –Humor did not originate with people, angels, or Satan. God created all good things, including good humor. –If God didnt have a good sense of humor, we as His image- bearers wouldnt either. 46 46 That God does have a sense of humor is evident in His creation. –Consider Aardvarks and baboons and giraffes. 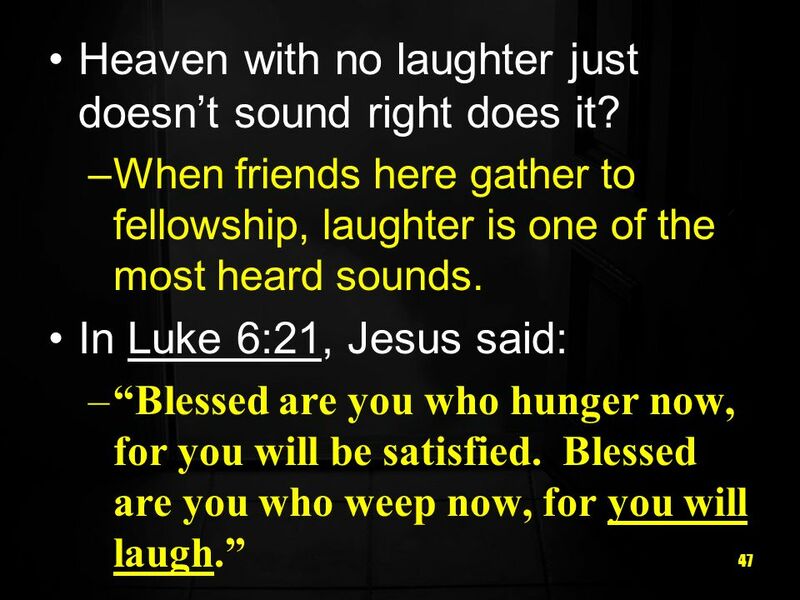 When laughter is prompted by what is appropriate, I believe God takes pleasure in it. 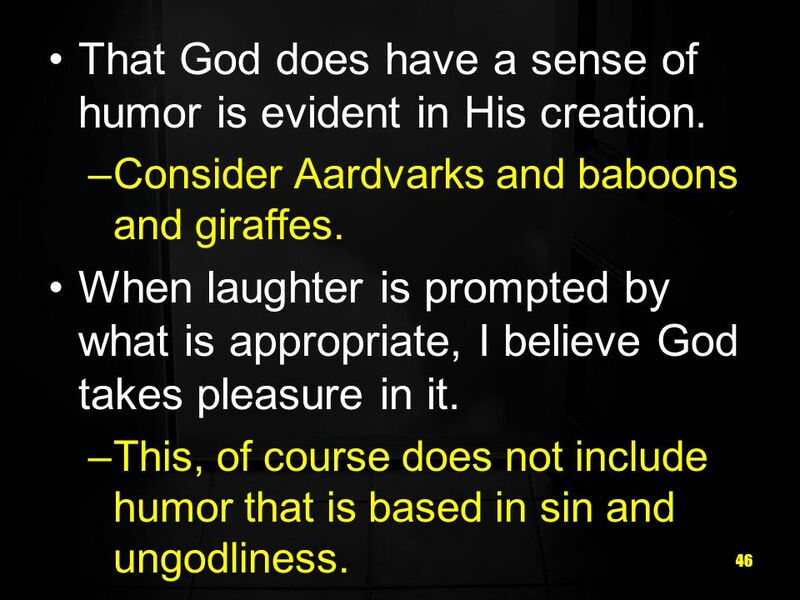 –This, of course does not include humor that is based in sin and ungodliness. 47 47 Heaven with no laughter just doesnt sound right does it? –When friends here gather to fellowship, laughter is one of the most heard sounds. In Luke 6:21, Jesus said: –Blessed are you who hunger now, for you will be satisfied. Blessed are you who weep now, for you will laugh. 48 48 When will we be satisfied? In Heaven! –When will we laugh? In Heaven. Can we be sure Jesus was speaking of Heaven? 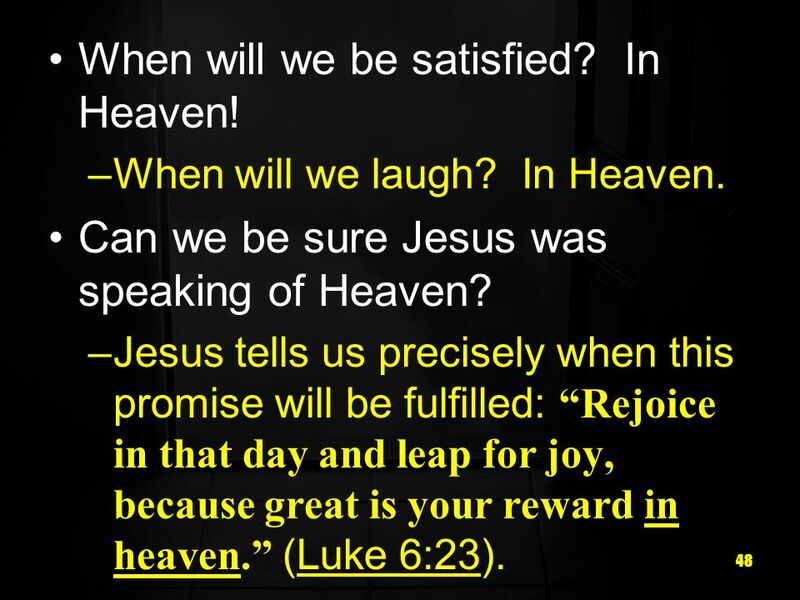 –Jesus tells us precisely when this promise will be fulfilled: Rejoice in that day and leap for joy, because great is your reward in heaven. (Luke 6:23). 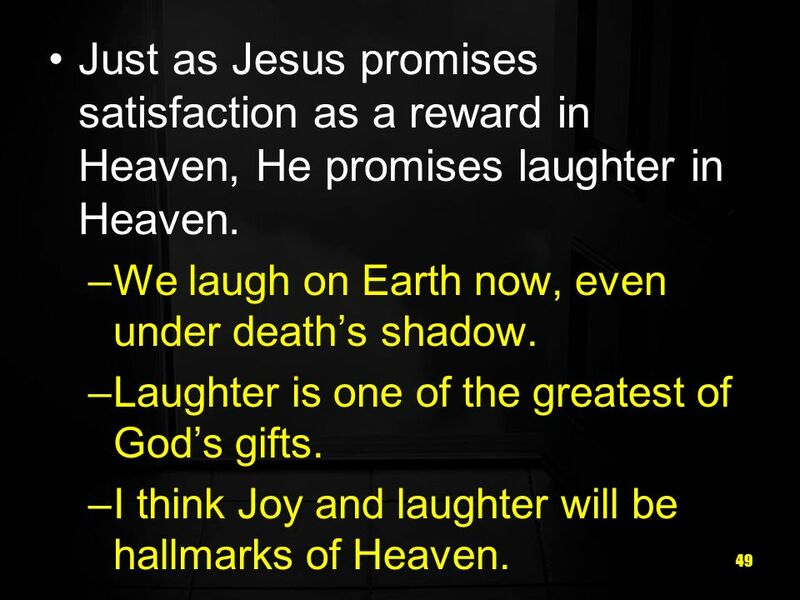 49 49 Just as Jesus promises satisfaction as a reward in Heaven, He promises laughter in Heaven. –We laugh on Earth now, even under deaths shadow. –Laughter is one of the greatest of Gods gifts. –I think Joy and laughter will be hallmarks of Heaven. 50 50 Laughter is often the result of something entertaining having been said or done. 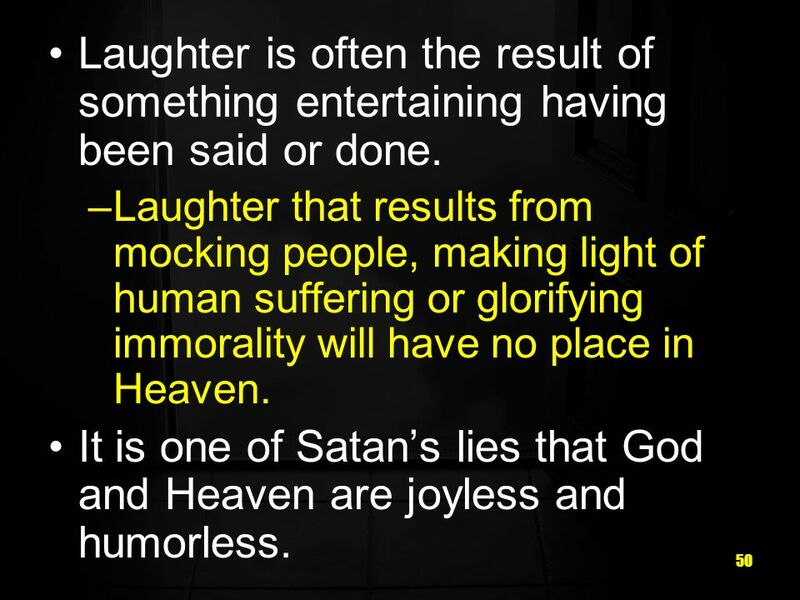 –Laughter that results from mocking people, making light of human suffering or glorifying immorality will have no place in Heaven. It is one of Satans lies that God and Heaven are joyless and humorless. 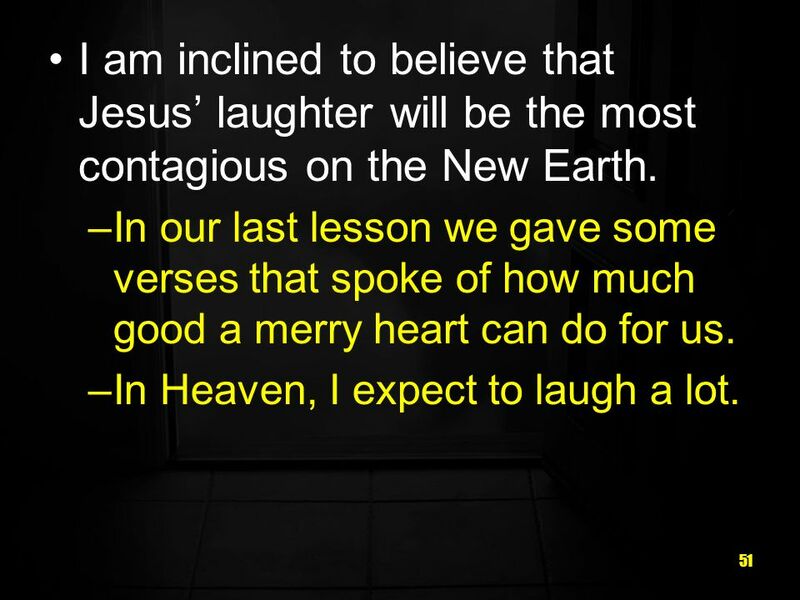 51 51 I am inclined to believe that Jesus laughter will be the most contagious on the New Earth. –In our last lesson we gave some verses that spoke of how much good a merry heart can do for us. –In Heaven, I expect to laugh a lot. 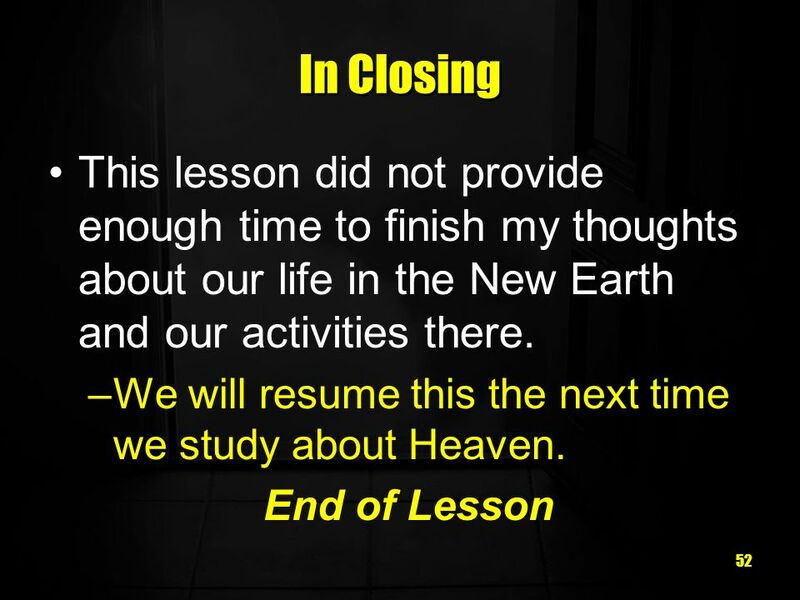 Download ppt "2 In this lesson we will continue to look at what life may be like in the eternal Heaven, and why we will not be bored there. –We have been talking about." What Is Life’s Purpose? By Glenn Kenadjian. Should We Use Musical Instruments In Our Worship To God? c.a Sabellian - Oneness Pentecostal c.a Arian - Jehovahs Witnesses c.a Socinian - M. Ghandi Trinitarian - 3 personalities yet 1. Introduction All throughout the Bible, God’s people sang. (the Israelites victory over the Egyptians and worship in the temple, Jesus and the apostles.